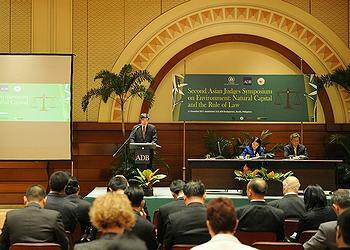 MANILA, Philippines, December 12, 2013 (ENS) – An Asian Judges Network on Environment has been formally launched in Manila, marking a new stage of cooperation among justices charged with enforcing environmental laws and helping to preserve Asia’s natural capital. The three-day Second Asian Judges Symposium on Environment held last week drew eminent judges and representatives of courts, environment ministries, prosecutor’s offices, the legal profession, and civil society from the Asia Pacific region and beyond. The Asian Development Bank hosted the event in partnership with the Supreme Court of Philippines, with Chief Justice Maria Lourdes Sereno in attendance. Other partners included the United Nations Environment Program, World Wildlife Fund, United States Agency for International Development, and the Freeland Foundation. Nakao said he is encouraged by recent developments to strengthen environmental law enforcement across Asia. “The Chief Justice of Indonesia announced his decree to certify specialist environmental judges and ensure they decide environmental cases,” he said. “The Chief Justices of Pakistan and Malaysia have established environmental courts and judicial environmental training,” he said. “And the Chief Justices of Vietnam and Sri Lanka have committed to carry the torch forward in terms of the regional vision and national commitments into 2014,” Nakao told the symposium. The bank has also supported delegations of Asian justices to join globally significant environmental events, including the Rio Conference, the Convention on Biodiversity, and the Convention on International Trade in Endangered Species,” said Nakao. Some of the most serious crimes involve trafficking in wildlife from Africa and Southeast Asia to other areas in Asia, and trafficking in timber from Southeast Asia to the European Union and other areas in Asia. 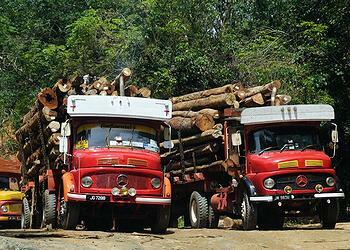 The illegal trade in timber between Southeast Asia and the European Union and other areas in Asia was worth an estimated $3.5 billion in 2010. By contrast, sales of elephant ivory, rhino horn and tiger parts in Asia were worth an estimated $75 million in 2010, but the environmental impact of this crime is greater than the relatively small income it generates for criminals, according to the UN Office on Drugs and Crime. The judges’ new network is the culmination of work begun at the first Asian Judges Symposium on the Environment held at Asian Development Bank headquarters in 2010. There, 110 of the region’s justices called for just such an Asian Judges Network on Environment. “Chief Justices and their senior judiciary play a critical role in improving environmental enforcement and strengthening the rule of law,” said Asian Development Bank General Counsel Christopher Stephens. “They can champion and lead the rest of the legal profession, the law enforcement community, and broader public toward rule of law systems that promote environmental justice,” Stephens said. Last week’s symposium covered a broad range of topics, including recent judicial innovations in environmental cases in the region, and increasing understanding of the true economic value of natural capital and its contribution to socioeconomic development. Natural capital is under threat from the human appetite for resources, and from damaging practices like illegal logging, wildlife poaching, destructive fishing activity, and pollution, symposium participants conluded. Although it is a huge provider of services and jobs, there are gaps in valuing the true worth of natural capital across Asia, and existing laws to protect resources need to be strengthened, they believe. The Asian Development Bank, under its Environmental Law, Justice and Development Program, is helping to generate knowledge on environmental challenges among judiciaries, and to strengthen the capacity of judges to decide environmental cases and to share experiences. Along with hosting sub-regional roundtables on the environment for senior judges from ASEAN member countries and South Asia, the bank has also worked on programs with national judiciaries.